Home Local News President Duterte gustong Patayin Lahat ng Terrorista " Huwag pakainin ang mga yan dagdag gastos lang!" President Duterte gustong Patayin Lahat ng Terrorista " Huwag pakainin ang mga yan dagdag gastos lang!" 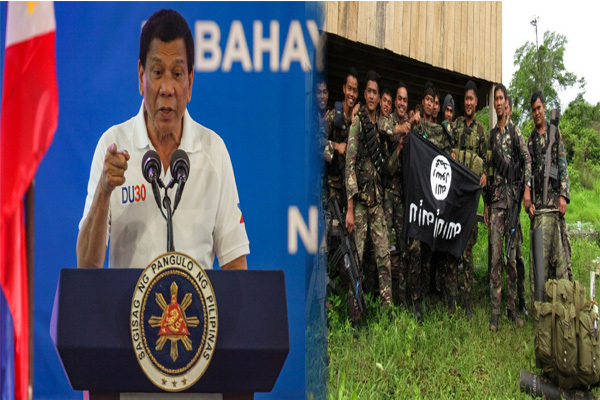 President Rodrigo Duterte gives out orders to ensure the death of the terrorists because he refuses to have to provide for them if they are in prison. The President also pointed out the possibility of these terrorists being able to counterattack the government should they be left alive. Advertisement President Rodrigo Duterte does not want to take any prisoners in the ongoing operation to flush out terrorists in Marawi City. Not only because the terrorists would fire back and kill them, but because it would mean spending money for them to keep them in prison. “When I say, wipe them out, better. If you shoot him in the head, shoot it again in the heart para sigurado. Otherwise, kung maka-eskapo ‘yan at ikaw ang mahuli. Giyera ‘to, patayan ‘to. Nobody asked for it. Bakit kita bubuhayin kung kaharap ka ng… Papakain ko pa ‘yang putang inang ‘yan. Mag-gasto pa. Patayan kaya ang gusto mo, eh ‘di sige,” he said.